What To Expect From Starbucks’ Q2 2019 Results? Starbucks To Continue The Growth In Fiscal Year 2019? How Much Is Starbucks’ Revenue Likely To Grow Through 2020? Can Starbucks Do Well In A Land That Gave Us Espresso? Will The China Slowdown Impact Starbucks’ Third Quarter Performance? Is Nestle Overvaluing Starbucks’ Packaged Goods Business? How Can Competition With Luckin Coffee Affect Starbucks’ Valuation? Starbucks (NASDAQ: SBUX) recently reported its Quarter 1 results (ended December 2018) for the Financial Year 2019. The company beat the consensus in revenues and earnings and posted $6.6 billion and $0.61, respectively. The total revenue is up by 9% year on year (YOY) and comparable sales are up by 4% globally driven by 3% in average ticket size. China’s comparable sales are up 1% YOY but the Total stores are up by 18% YOY. The company opened 541 net new stores. Of those, over two-thirds are outside the US and about 50% are licensed stores. This takes the Total Store count to 29,865 at the end of December 2018. We maintain our $66 price estimate for Starbucks. 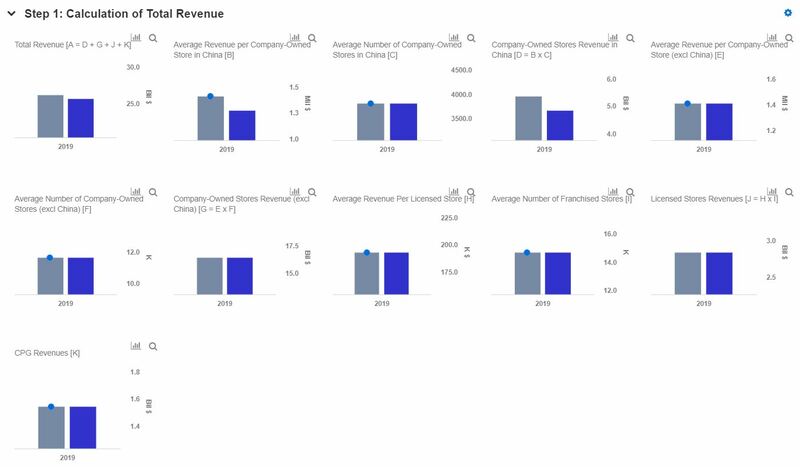 In our interactive dashboard How Will Starbucks Valuation Be Affected If Average Store Sales In China Fall By 10% in FY 2019 we provide a scenario in which we estimate Starbucks’ Share Price in a situation where the average store sales falls by 10% due to recent competition from the domestic brands like Luckin Coffee. In addition, here is more Consumer Discretionary data. Luckin Coffee has emerged as a very strong competitor to Starbucks in China. The Chinese coffee chain opened its first store in Beijing in 2018 and already has more than 2,000 locations. The company says that it is targeting a total of more than 4,500 stores in China by the end of 2019. This would take it past Starbucks, which has long dominated the Chinese coffee market and currently has over 3,600 stores there. Recently Starbucks CEO Kevin Johnson said “Starbucks Corp is unlikely to cede its leading position in China, the company’s fastest-growing major market, to Chinese startup Luckin in 2019”. One of Luckin’s advantages is the price, which is 20-30% less than Starbucks’ products. The company also attracted customers with a sales campaign offering a free third coffee with the purchase of two cups. Luckin is also using a recruiting strategy which would hurt Starbucks. It is offering monthly salaries of 20,000 yuan to 30,000 yuan ($3,000 to $4,400) for staff with more than a decade’s experience in cafes. In contrast, the average office worker in Shanghai makes 10,000 yuan a month. Inducements such as this could cause a significant number of employees switching toward Luckin. In this scenario analysis we calculate the effect on Starbucks’ valuation if the competition with Luckin pulls down average revenue per store in China by 10%. Overall for this Scenario, this estimate would result in a downside of $1.40 (2% of the current Trefis Price of $66). China is important for the growth of Starbucks, but the company is well diversified so that it is not very largely affected, even if the average revenue per store in the country falls by 10%.